If there’s one thing that I have to criticize the Iron Man movies for, it is having a Tony Stark who is, in terms of his persona, someone absolutely impossible to sympathize with. His runaway ego may be realistic in certain senses, and certainly reflects the actor himself, playing up the runaway billionaire aspect, but it creates a detachment effect between Tony Stark’s character and the viewer that creates much more separation than the armored suit itself. 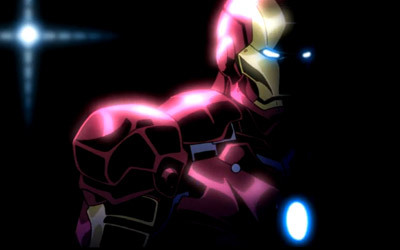 That’s not what we’re seeing with the Iron Man anime that is currently airing in Japan. The eighth episode has aired, and capping several weeks of strength, we get to see a Tony Stark who is, for one thing, more human. Put differently, this Tony is better at being human – and he thanks Dr. Yinsen for turning his life around and saving not only his life, but his soul. I have chosen not to write further about this without spoiler tags, because this is a massive plot point for the show, and for now, I will pass because it is not immediately relevant to my point: this Tony is trying hard to live a proper life, but faces great skepticism in his efforts. This skepticism is rooted in three places: the Japanese public – for Tony is in Japan to oversee the completion of a major company project there; the Japanese government, which deeply distrusts this American; and the terrorist organization Zodiac, which cranks out our regular Enemy of the Week and is, so far, more than adequately filling the role of organizational antagonist. Zodiac is essentially aiming its efforts at breaking Tony Stark, the human. While it might not shed too many tears if he were to die as a result of its efforts, what they have sought to break is not just his body, but that very human soul that defines Tony’s character in this anime. This Tony actually says with a straight face that he’s not a man who lies easily. At least, that’s what he tells the girls. Even with Japanese script writing and dialog, he comes through as a very confident man – but with many demons he has fought and continues to fight. Most importantly, a show like this, to make compelling episodes, has to give us people to care about, even if this process is, by its nature, very “comic book.” That’s not, however, the point. The point is, the Tony Stark character really does care about the people who he tries to save. It’s the genuine emotion shown by the character for other people, and not simply for his own egotistical satisfaction, for his reputation, for his company, for his legacy, or just because he feels like it, or even to prove his worth as a human being. He’s doing it because he actually gives a damn. This is a Tony Stark I have missed, and any reader of recent American comics, or viewer of the Iron Man movies, should know, without further explanation, exactly what I am talking about. This is a Tony Stark who lives up to the status of hero, and that is something I have not seen for what feels like a very long time. For that alone, I recommend this show to fans of Iron Man. I have chosen those words carefully. A great many people are fans of Iron Man while studiously avoiding being fans of Tony Stark. Watch this show, and you won’t have to choose. You can just watch and enjoy. This entry was posted in Anime, Culture, Japan, Movies and tagged anime, culture, Iron Man, Japan, Tony Stark, TV. Bookmark the permalink.